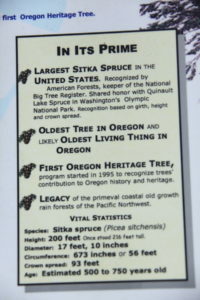 Arnie (my alter ego) and I left Portland and scooted west along Oregon Highway 26 headed for Klootchy Creek County Park to take a look at the famous big Sitka spruce tree we’d heard about and grab a long over due Pacific Ocean fix. Highway 26 . . . and all highways that climb and descend Oregon’s Coast Mountains are treasures of eye-wealth. Patches of roadside flowers, overhanging trees tunneling their way through the dense forests, and stands of evergreens quilt the mountain slopes. 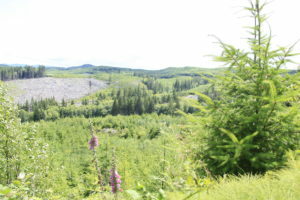 Occasionally, we paralleled a row of trees left standing as a visual buffer between a recent clear-cut logging operation and the highway. “Can’t fool me,” I said gesturing toward a space in the buffer between the highway and the logged off area. “About what?” a perplexed Arnie said, looking at the trees. “Yeah, bulldozers snarling loud and howling donkey loaders and yarders arguing with each other at the top of their lungs. It was then that the line of buffer trees gave way to an open area. 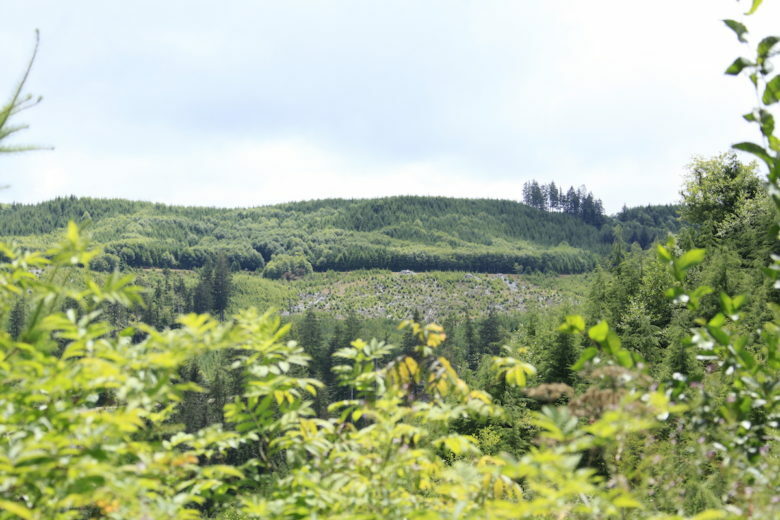 On both sides of the highway were stretches of new growth where the logged off area had been replanted. “You still call that ugly?” Arnie asked surveying the expanse of young trees stretching in all directions. I didn’t answer . . . because, in a way I do talk to animals . . . at least in my imagination. And, as I thought about it, Arnie was right . . . opening up the forest floor to sunlight is good for animals . . . it allows food to grow and brush for small critters to hide in. Nearly an hour had passed by the time we pulled onto Klootchy Creek Road. 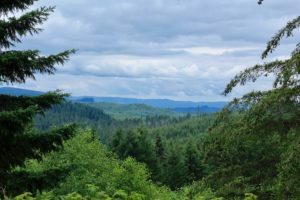 At the edge of a wooded area, a sign told us that in 2006 a severe storm tore away a rotted portion weakening what was the largest living tree in Oregon. In 2007 a second wind storm took more of the old faithful. 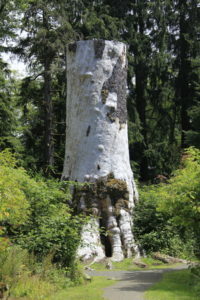 Fearing possible injury to visitors the old tree was topped leaving only the 40-foot stump. Arnie and I walked around the imposing residue of what was left of the ancient tree. “Just think, Arnie,” I said, “700 years ago, about the same time the Magna Carta was signed, a bird or some other animal dropped a seed . . . or two . . . on the ground . . . right here . . . and she began to grow.” I paused in my wonder. “And grow and grow,” Arnie said, sharing my awe. “I’m a tree whisperer,” Arnie answered with a chuckle. We both laughed. Then Arnie added, “I also talk with KC . . . he knows these trees better than anyone. Thanks. It gives one a lot to think about.